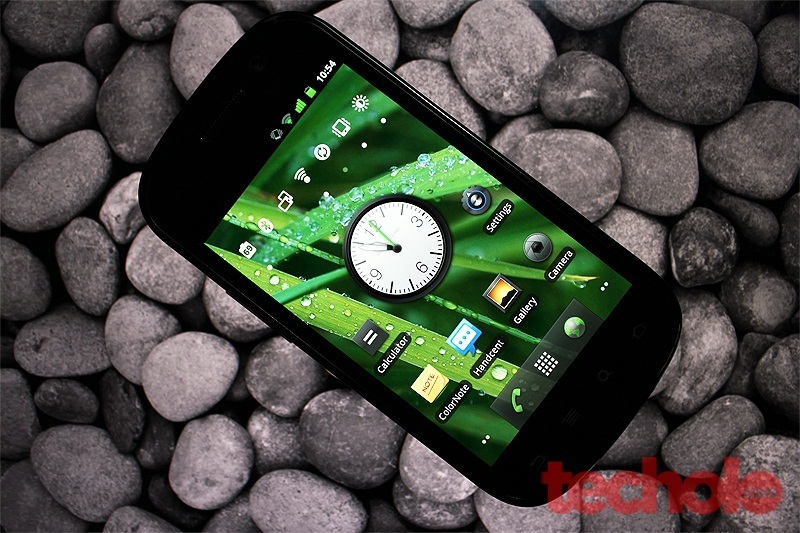 The Google Nexus S is Google’s new flagship phone after the highly praised Nexus One. Is second times a charm for Google? I bought the phone in the USA. Sold by T-mobile. All Nexus S are sold unlocked and comes with vanilla Android, meaning no third party skins, no waiting on carriers and manufacturers to update to a newer firmware. It is the first Gingerbread phone. 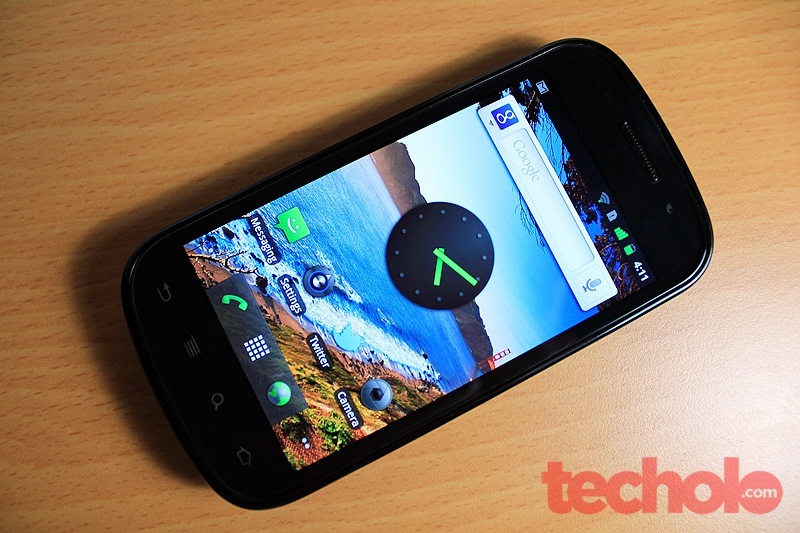 Samsung Philippines just launched the Nexus S in the country last March 2011. Although I haven’t seen any stores selling this yet, I’m sure that official support and service is already active locally. That is good news for all aspiring owners of the phone. 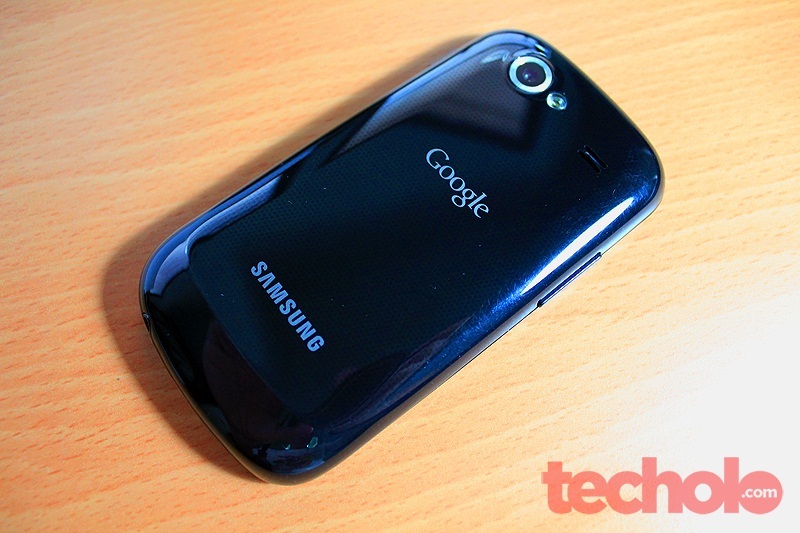 This Nexus S is built by Samsung and not HTC which made the first Google Phone. Many speculate that this is because of Samsung’s highly successful Galaxy S series and maybe because Samsung’s 1Ghz Hummingbird processor is faster than HTC’s 1Ghz Qualcomm Snapdragon’s. 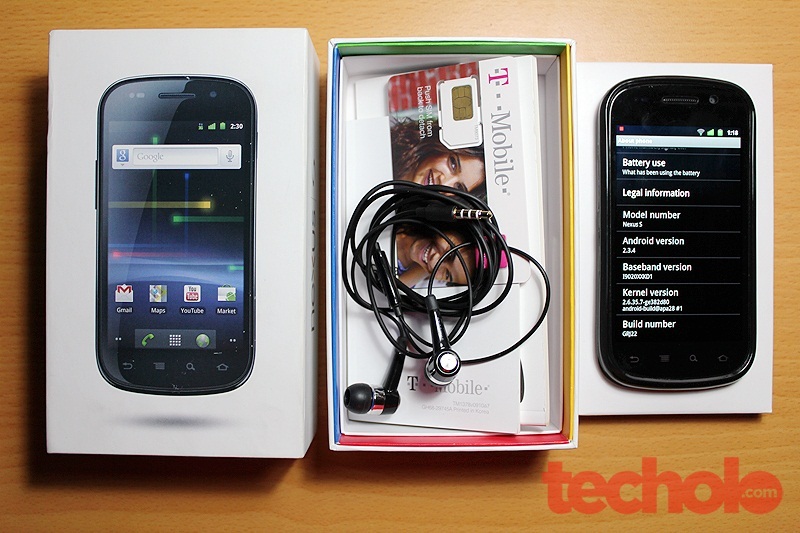 Inside the box were the following: Nexus S, T-Mobile Sim Card, In-ear headset, USB sync/charging cable, AC adapter and manuals. 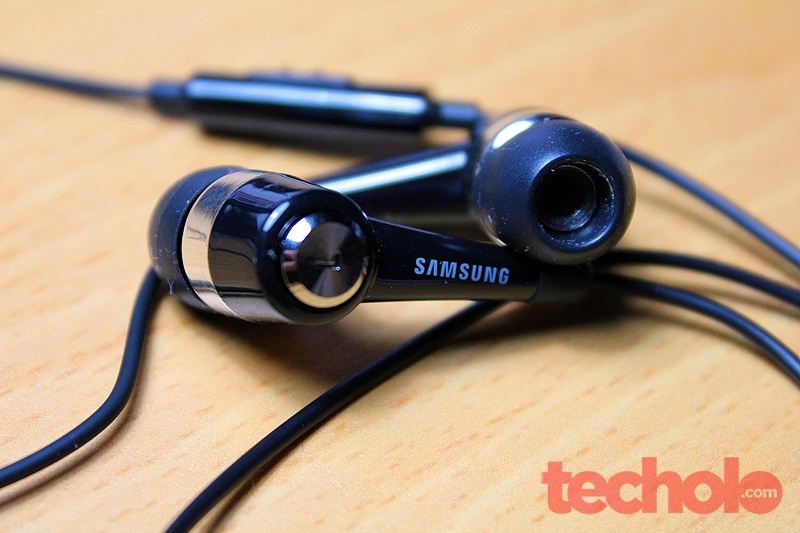 I really don’t like in-ear headsets. It just doesn’t feel right on my ear. I also don’t hear outside noises as much as I want to, especially while outside. I don’t want to get hit by some fast car because I didn’t hear it coming. At the front of the Nexus S you can see the front facing camera on the top most right. Yes, the Nexus S has a front-facing camera that can be used for Skype and GTalk chats (2.3.4 update) Below are the 4 capacitive buttons. Back, Menu, Search and Home. Responsive capacitive buttons. One thing if I were to complain is that I often hit the Home key with the ‘body’ of my right thumb when holding it. The out-of the-box firmware was Gingerbread 2.3.1. Shortly after released, Google made available the 2.3.2 and then the 2.3.3 update. The 2.3.3 update gained much publicity and some backlash because it changed ( or fixed if you ask Google) the display tint of the Super AMOLED screen from cold blues to a now warmer hue. I already updated to the current 2.3.4 as of writing this post. 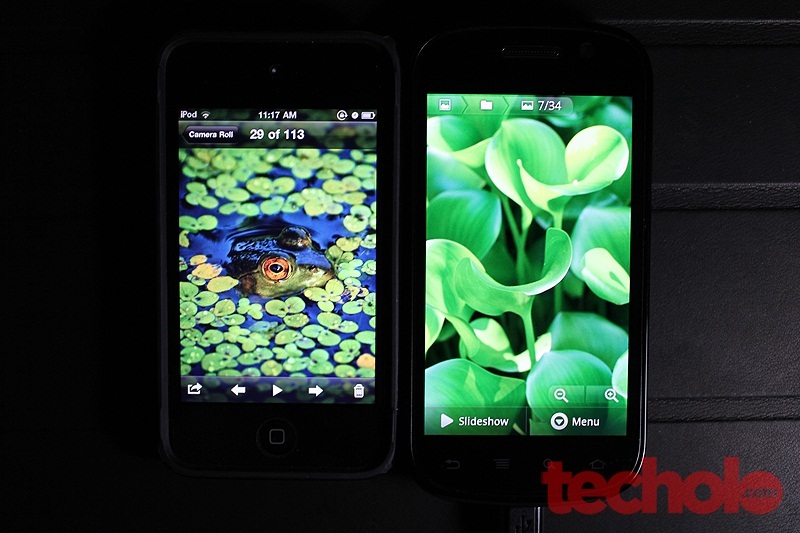 This is comparing the 4” Super AMOLED display of the Nexus S on the right. The iPod Touch’s 4G 3.5” Retina display on the left. Both were set on 100% brightness. Have to see it personally to distinguish the difference. Retina Display wins for resolution. Super AMOLED wins for the clarity and vividness of the colors. The back is made of plastic but it is not flimsy at all. It houses underneath the NFC chip (Near Field Communication) that allows simple data transfer by just hovering the device on top of an NFC chip enabled tags. Example: swiping above a movie poster open up the movie’s website. Swiping on LRT turnstiles to pay-on-the-go, and many more... The technology is still in its infancy in the US and thus won’t be coming anytime soon here in the Philippines. The 5 megapixel camera and LED flash can also be seen. The camera actually takes very good images.And while the video is not capable of recording in 720p HD, the output is still quite manageable at 720 x 480 resolution. Rumor has it that because of the added NFC chip, the more capable HD optical sensor was sacrificed for this model. The Galaxy S which is basically has the same hardware specs as the Nexus S can record at 720p. The battery life of the Nexus s can go for days. But don’t expect it to have a battery life similar to your old Nokia dumb phones. Remember that this one is running 1Ghz processor inside and a large 4” display so that will surely eat some of your power. I typically charge everyday when I’m at my computer but I think the Nexus S can go for 2 1/2 to 3 days on a single charge with minimal usage. The only problem I’ve encountered, and some people as well, have been the super slow charging times on a computer usb port. I had once charged for a 72% battery for 1 hour and it only bumped up to 80%. That is very slowwwww. The charging times using the AC adapter was much better. For being a powerful smartphone. I find the battery life exceeded my expectations. My old Palm Pre Plus can barely hold a charge after a day and it’s not even running at 1Ghz. 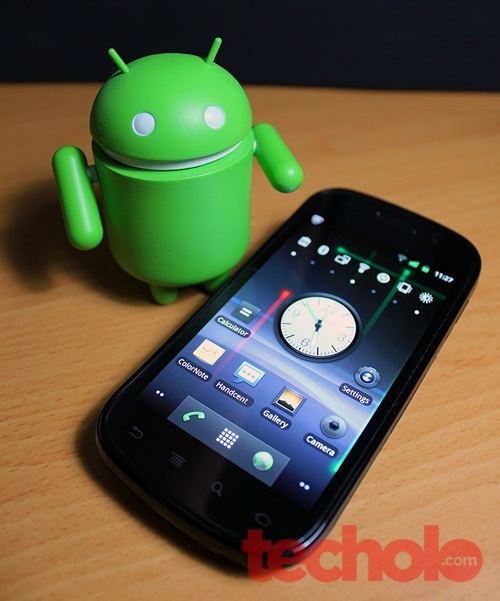 I think that the Nexus S is a worthy upgrade for those looking for their next Android smartphone. While it may not boast dual-processors. I think those are overkill anyways beside being battery power eaters, they do not, in a practical sense, improve your user experience by making your device more faster that it is right now at 1Ghz or even 800mhz. 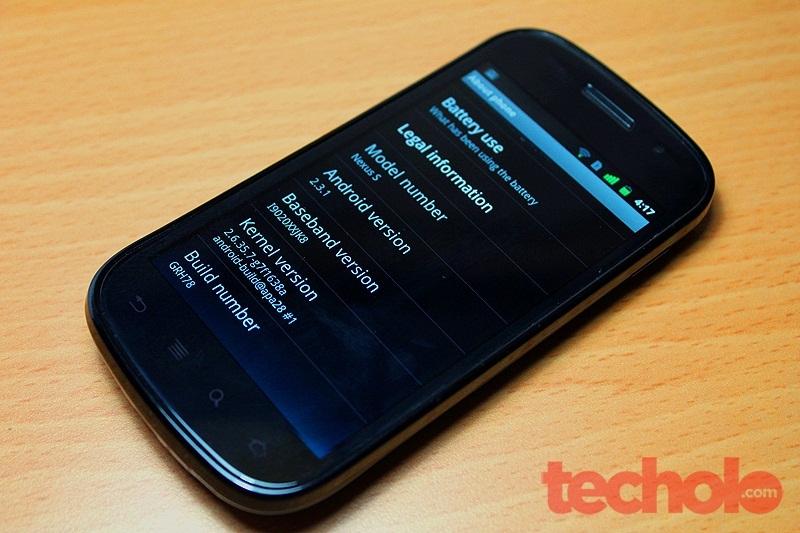 The Nexus S improves on some major features compared to the original Nexus One. The improved larger 4” Super AMOLED display, faster 1Ghz Hummingbird processor and front-facing camera alone, for me, is well worth the upgrade. If you can find it at a 23,000 to 25,000 peso price range then it is a good buy already. I’d suggest trying to hold one and better even if you can turn it on. Believe me, the Super AMOLED display will spoil your eyes away from any other display, even Retina Display. 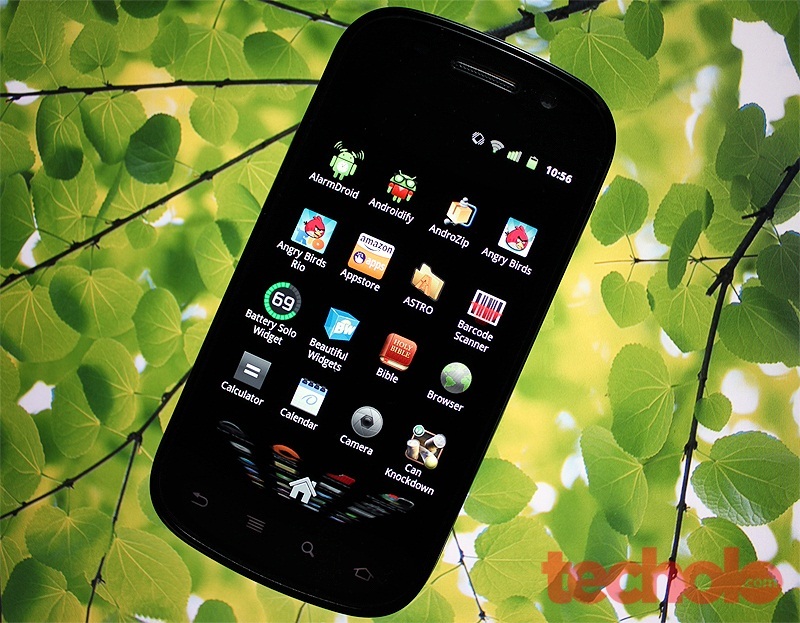 Stock Android easy to update, Comes with Gingerbread. Very awesome Super AMOLED display.